How do I use Raycast? Where can I download the latest version of the Raycast effect? Friend: HAVE YOU SEEN THE AMAZING MMD RAYCAST VIDEOS??? THAT SHADER IS SO COOL, RIGHT??? Just joking! Raycast is a powerful and sophisticated, complicated effect… but ya just need to know the basics to get started! For this demo, I’m gonna use the new raycast 1.3.0 … a 47Mb download! EDITOR’S NOTE: I found that the version 1.3.0 worked well for me. 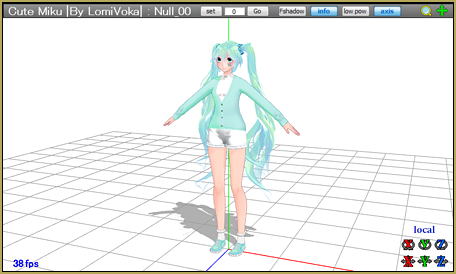 … this model will work (Cute Miku by LomiVoka). 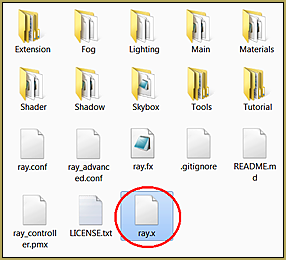 When you load the main.fx it will look horrible!… and that’s why we MUST load ray.x in the main Raycast folder. 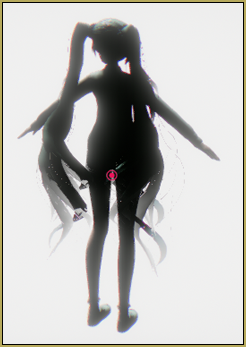 EDITOR’S NOTE: When I loaded ray.x, MMD seemed to lock-up because my system took a long time to open/process that file… and when it DID come back, the stage was SOLID Black. 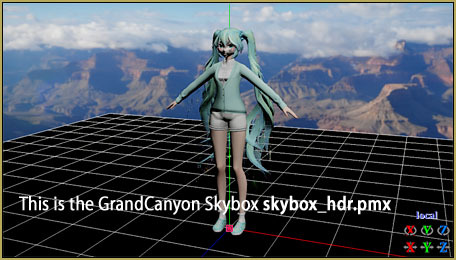 Go ahead to the next step and load a Skybox model to get your stage back. … but there are some weird spots! 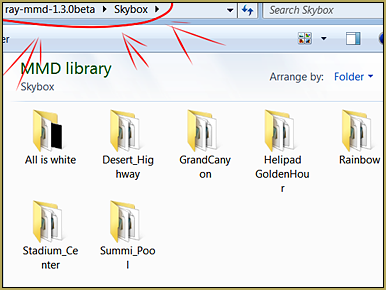 Loading the Skybox gets rid of all of those weird spots we saw in that image, above. GREAT… now load a background image or your favorite skydome and probably hide the coordinate-axis. by loading the ray controller.pmx model. When we load the controller we suddenly have control of allot of settings and effects! 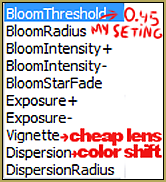 There is kind of a cheap-lens effect and a color-shift effect and using BloomThreshold we will make everything very pretty. … but it is a little dark from the other sides! 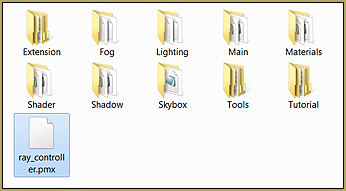 Well, then, let’s load some lighting! You can change the position and swivel the light direction of the DirectionalLight using the XYZ rollers. Swivel the light to shine on the front, back or side of your model. … and change the quality of the light with the facial sliders. In my image, I loaded the DirectionalLight model three times so I could add light where I wanted it on my model! 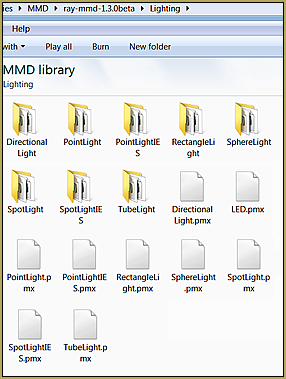 You can easily hide the lights model by going to MME and click “Hide/Show” in MME tabs Main, MaterialMap, Depthmap, PSSM. The arrows show from what positions my lighting is coming as I lit her with the three DirectionalLighting models. You can go to MME/MaterialMap and apply the effect to your model. I will show you how they look when applied in the image, below. link1 link2 … there should be instructions in the description. 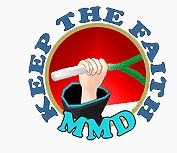 Have fun with Raycast and MMD! 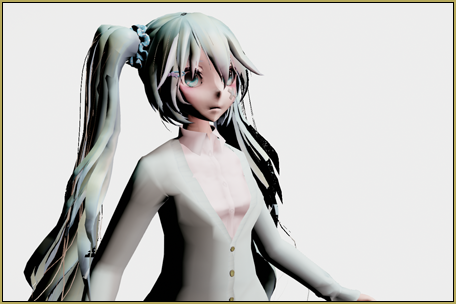 Hi, parts of my model’s hair turns dark when i tried to load ray.x into the scene. 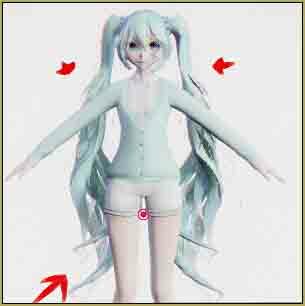 Could it due to the model’s hair being transparent underneath? 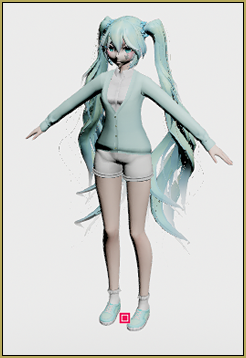 It looks as if the hair does not reflect the shader properly because the hair is transparent. Have we talked about this, before? … very familiar… I think I mentioned on Facebook that you might lave a comment here to ask for assistance… Yes? We will need more info… Does this happen with all, any of your models? or just this one you have an issue with? Have you ever gotten Raycast to work for you? Have you gone through the proper steps of setting-up Raycast?… it is NOT simple, you must load the controller, load a skybox… there is a lot to it… complicated stuff. … Please see the articles/tutorials we have posted… see if you can learn to set it up… and then see if you still have the same problems. 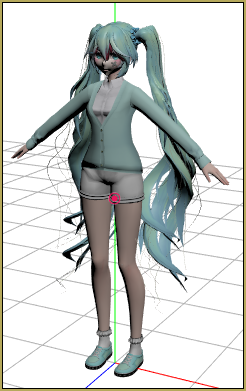 when i load ray.x i get weird green spots on my model’s hair…why is that? Ray-MMD / Raycast is strange and wonderful… did you load a Skybox model yet? … That will get rid of the odd artifacts. 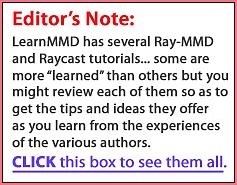 Read about Raycast with these articles… read them CAREFULLY to get all of the info. Raycast is powerful and complicated… you must do it correctly. 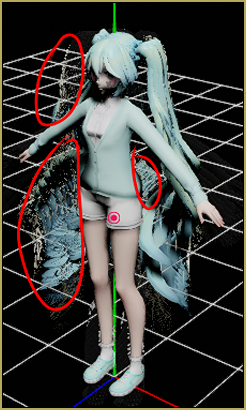 When I load the skybox I get green spots in her hair… This happens with every model, how do I fix it? 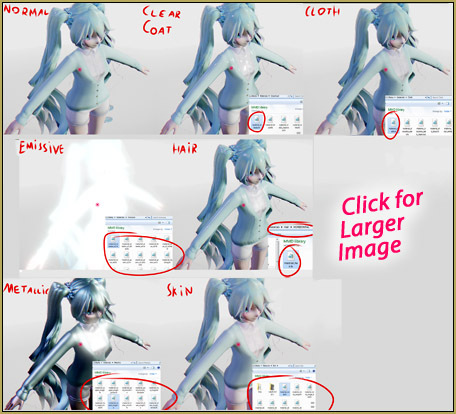 Ray-MMD / Raycast is strange and wonderful… Read about Raycast with these articles… read them CAREFULLY to get all of the info. Raycast is powerful and complicated… you must do it correctly. Hi I have a problem every time I try to add effect it said “failed to add it ” and some people say update graphics I update my graphics but error still appear . Does it happen to every effect or just to this one? Make sure you have DirectX 9.0c installed. So do the check for DirectX 9.0c. Is this every raycast effect or every effect? What is the glitch that occurs? Is there a pop-up message, and if so, what does it say? I Googled your error… seems to be encountered by DirectX gamers and game-developers. I did not see any simple fix. 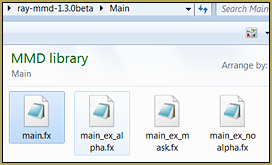 … I DO know that Raycast 1.3 is written for Windows 10 64-bit. If you are not running 64-bit, that could be the issue. … that’s all I’ve got. So, if you ARE running 64-bit, I don’t know what to tell you. You are the first MMDer to ask that question of us. humm, thank you, i have a idea to fix it. I’m not a programer so i don’t undersdtand some answers. But you gave me a good idea. I work with Win 7 and 64 Bit system (some of my programmes where i need don’t work with 10 correct) so i must use a older raycast version. Or, yeah, you could try out a different version of Raycast. I’ve got no answer for you. Raycast is a powerful “system” that needs a strong computer… needs 64-bit Windows 10 and a powerful dedicated graphics card, not an on-board integrated graphics chip. We just have to face it: there is no substitute for a powerful computer when you want to run Raycast. 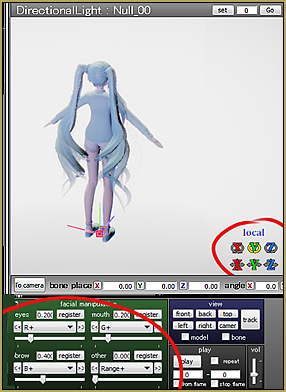 For some reason parts of my model glow when i follow these steps, are there things I need to check to remedy that? Do you use other effects than Raycast in this particular scene? In particular, do you use AutoLuminous? If so, you may try to open MME’s Effect Mapping panel, select AL_Emitter panel, and uncheck the model in it (*not* remove AL_Object.fxsub effect from it – that will do rather the opposite result). Some of glowing parts may stop to glow. Still, the intensity of lightning may remain increased – in this case try to replace AutoLuminous with AutoLuminousBasic (the look will be different from the regular one, though). If there’s no AutoLuminous. but there are other effects, try to disable/remove them one by one to see if one of them in particular produces this side effect in conjunction with Raycast. If you find the culprit, write back to us, so we can develop the necessary procedure for your case. If you use no other effects in the scene, and the model still glows, you will need to edit it in PMDE/PMXE. Find the material that produces unnecessary glow and reduce its Reflect (“Refl.int.”) parameter. Always keep the backup, of course.